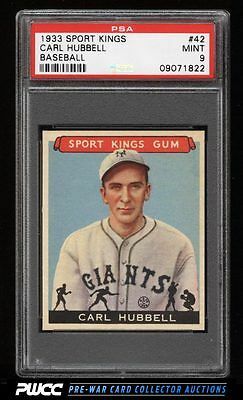 Spectacular '33 Hubbell which is one of only seven to reach the PSA designation and is surely among the best 9s in the hobby. Boasts near perfect centering with four exceedingly sharp corners and undeniable MINT card stock. Four crisp edges with virtually flawless surfaces. The finest example we've brokered in our tenure and deserving of attention. Part of a jaw dropping '33 Sport Kings set break on the auction block this month. This offering represents the current #1 finest '33 Sport Kings set on the PSA registry and is deserving of serious attention. One of over 11,000 cards, lots, and sets up for bid in our 9th Auction of 2016. Click on the link above to view the other PWCC auction lots.